I arrived at Todd and Gabrielle’s house near Twin Lakes, Colorado at 8:00. By 8:45 Todd and I were strapping on our packs at the trail head on the east side of Independence Pass on Highway 82 at 10,800 feet. 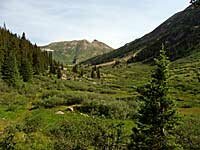 It is a very scenic, gradually ascending trail heading north along North Fork Lake Creek into the Mt. Massive Wilderness. There are a few evergreens, lots of bushes, wildflowers and views of 13,000 foot peaks in all directions. 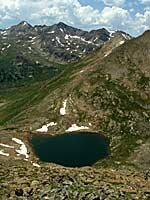 At about 11,600 feet, the trail steepens quite a bit and by 12 o'clock we reached the 12,400 foot level and an unnamed lake 50 feet below the pass over which is the trail to Fryingpan River and the Frying Pan Lakes. We saw dozens and dozens of 10-12 inch fish in the lake feeding on bugs that seemed to cling to the surface. Todd remarked that he would be back someday with his fishing gear. I ate half my lunch at the lake and we proceeded the additional 50 vertical feet to the top of the pass. The view of the Fryingpan Lakes and Mount of The Holy Cross in the distance from the pass was great. Our plan had been to climb adjacent Deer Mountain which tops out at 13,761 feet. Checking out its ridge much of the morning we were unsure if it seemed like what we wanted to be doing this afternoon. Previous experience climbing on loose scree makes us wary of such climbs, as it take some of the fun out of it. From the pass, we decided to climb a few hundred feet anyway to get on the ridge to see if it would be suitable for a mellow climb. It was not to be. The ridge is jagged, with lots of loose rock, so we decided to abandon the summit and hike to another nearby unnamed lake we had seen on the map, between Deer Mountain and Mt. Champion. A treacherous traverse to that lake had us scrambling across more steep loose rock and dirt and we were wondering if we might have been better off going for the summit or descending to 12,000 feet and climbing back up to the lake. The second lake was very nice at just under 12,400 feet and we took a long break there before descending back to Todd’s truck. There was a bit of rain on the two hour hike down but not enough to dampen our enjoyment of the end of the hike. We were done by 5:15. Gabrielle was kind enough to have a delicious dinner waiting when we returned.